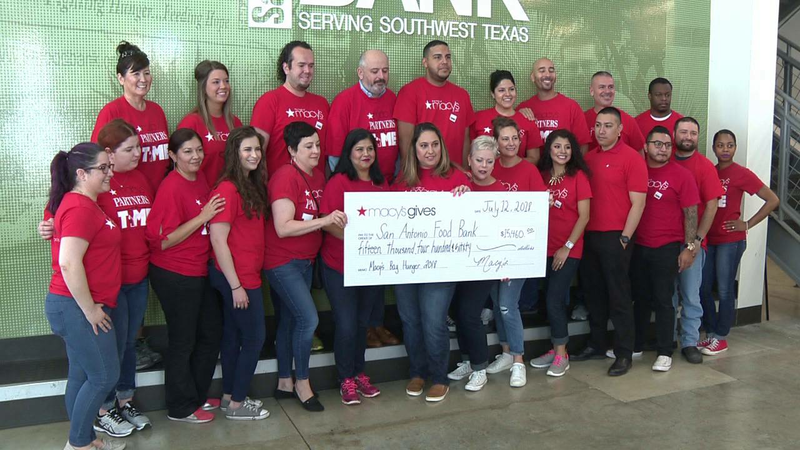 SAN ANTONIO - Local Macy's colleagues presented a $15,460 check Thursday to the San Antonio Food Bank. The money was raised in March through Macy's Bag Hunger campaign, where colleagues and customers come together to raise money to fight hunger. The check will provide year-round support to the Food Bank, which includes emergency food assistance programs and summer meals for children who typically rely on school meal programs. "This is the 20th anniversary of Our Partners In Time Give Back Donating For Bag Hunger. This is a nationwide campaign, and it brings all of our colleagues together to raise donations in-store for all of those in need in all of our communities," said Barb Quinn, vice president and store manager of Macy's at North Star Mall. Macy's colleagues also volunteered at the Food Bank by bagging boxes of food.